Victory in the Russo-Japanese War brought a great deal of confidence to Japan’s leaders, who now saw their Asian nation as the equal of the European colonial powers. It also brought a crushing load of debt, the extent of which remained unknown to the Japanese public, and the Treaty of Portsmouth ending the war did not include monetary reparations for Japan. The Japanese public responded with riots, feeling that a victory won on the battlefield had been stolen at the negotiating table. In addition to substantial cash payments, they believed that the Empire should have walked away with all of Sakhalin Island north of Japan and the Liaodong Peninsula in southern Manchuria including the naval base at Port Arthur. In the years that followed, Japan took out her aggression on nearby China, culminating in the Twenty-One Demands of 1915. But the Empire never mustered the economic and military strength to fully dominate East Asia, including China, as the most bellicose nationalists desired. 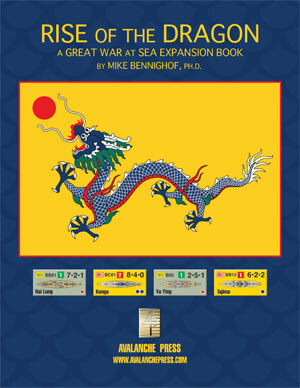 In our Long War alternative history, which includes Great War at Sea: Rise of the Dragon as well as Second World War at Sea: Plan Z and Great Pacific War: Co-Prosperity Sphere, things proceed somewhat differently for the Japanese Empire. By the time of the Russo-Japanese War, Japan has picked up a number of colonial possessions in the Pacific: Hawaii, the Philippines, Taiwan, the Marshall, Caroline and Marianas islands, North Borneo, Brunei and Sarawak. None of those colonies add anything to the Empire’s strength in 1904 and can do little for their own defense. But despite this drain on military resources, Japan manages to win both the war and the resulting peace. All of Sakhalin comes under the Rising Sun along with Korea and Russian rights in Manchuria. And perhaps most importantly for our alternative-history story line, the Russians are forced to pay a large cash indemnity. Knowing themselves to be the next target, the Chinese did not sit by idly as they did in our actual history. The Chinese studied building modern battleships in 1907, buying the battleships Triumph and Swiftsure from the Royal Navy. The ships – actually considered for purchase by the Chinese in our actual history – had been laid down for Chile and purchased by Britain to keep them from going to Russia instead for use against the Japanese. For the 1907 program the Chinese also considered ordering three pre-dreadnoughts from a Japanese shipbuilder and a coast-defense ship from Germany’s A.G. Vulkan (to a design originally drafted for Greece), but realized that technology had passed by the pre-dreadnought. In this alternative history that insight comes only after the ships have been laid down and payment rendered. In June 1909 in our actual history, Chinese Regent Prince Chun Zaifeng directed his brother Prince Tsai-hsun along with Admiral Sah Chen-ping to implement plans for a modern Chinese navy. The two set off on a world tour, visiting shipyards and gun factories in Britain, France, Germany, Austria-Hungary, Russia, Italy, Japan and the United States. They apparently had a good time everywhere they travelled except for France. They spread new orders for destroyers and training cruisers to most of the countries they had visited, but laid down a directive that no ships would be purchased in France. In reality, no ships would be purchased at all beyond that handful. But in this alternative history, the Chinese followed through with their plans and ordered construction of new dreadnoughts along with supporting cruisers and destroyers, placing contracts for two new dreadnoughts each in Germany, Austria-Hungary and the United States and buying three Brazilian dreadnoughts under construction in Britain. The new Chinese fleet would eventually number nine dreadnoughts, five pre-dreadnoughts, a coast-defense ship and sixteen cruisers, plus destroyers and other smaller vessels. To confront the Japanese, the Northern Fleet moved to the naval base at Wei-hai-Wai on the northern coast of the Shandong Peninsula. Inevitably, the Chinese effort touched off a renewed arms race in North-East Asia (with a number of British and Japanese firms benefitting by selling to both sides). Already committed to a major fleet building program, the pace of Japanese naval construction accelerated to meet the Chinese threat (itself, in the usual way, a reaction to the Japanese threat). The Kashima class of two pre-dreadnoughts, ordered in 1904 and completed in 1906, was expanded with two more ships, but these were not begun until immediately after the end of the Russo-Japanese War in 1905, when the return of peace allowed British shipyards – forbidden from supplying belligerent powers – to resume accepting Japanese orders for warships. Meanwhile, the Japanese had laid down two new battleships in Japanese yards, to carry an armament of twelve 12-inch guns each. Shortages of 12-inch guns in our history would lead to these ships being completed as semi-dreadnoughts with a mixed armament of 12-inch and 10-inch guns. Rather than two ships, the Imperial Japanese Navy ordered four, all built in Japanese yards, and all would receive a full allotment of 12-inch guns. The Japanese had counted on buying the three Brazilian dreadnoughts to give them superiority over the Chinese; seeing the ships go to their rivals sparked a panic in both naval and political circles. In response, Japan laid down four more dreadnoughts to an improved design. The Settsu class carried its dozen 12-inch guns in six turrets rather than eight, all of them long-barreled 50-caliber pieces (in our reality, there were but two ships in this class, armed with a mix of 50- and 45-caliber main guns). That would give Japan eight modern battleships once the newest ships completed in the summer of 1912. The Eight-Eight Fleet Plan approved in 1906 called for a fleet built around eight battleships and eight armored cruisers, and in 1905 the Japanese laid down a pair of fast armored cruisers to a design prepared by Vickers, with two more following in 1907. These ships carried six 12-inch guns, and their turbines gave them a speed of 26 knots. In our history, the Japanese rejected the Vickers six-gun, turbine-driven design as too expensive and laid down four slower ships with only four guns that were obsolete before their completion. To round out the second half of the Eight-Eight Fleet Plan, the Japanese ordered a new battle cruiser from Vickers in November 1910, to be the most powerful such ship in existence. Three sisters would be built in Japan. But with the Chinese rapidly completing their own fleet plan, in our history the Japanese choose to rush their program and purchase the Indefatigable-class battle cruisers Australia and New Zealand while still under construction, paying a premium price to allow them to be replaced with newer, more powerful Tiger-class ships. With Western eyes diverted by the outbreak of the Great War, a clash between the two expanded fleets would seem inevitable. That’s the story of Great War at Sea: Rise of the Dragon. You can order Rise of the Dragon right here.